This 3 double bedroomed villa is located in the beautiful San Marcial del Rubicon area of Playa Blanca, with stunning sea views, and only a 5 minute walk to the nearest beach, and a 10 to 15 minute walk from the picturesque Marina Rubicon. Our villa is a real home from home. The villa’s location combines the best of Playa Blanca, being on a quiet and private corner plot, yet within 30 minutes easy walk, you can be in Playa Blanca’s lovely town centre. The villa benefits from extensive sun terraces and a shaded dining area downstairs, and a furnished upstairs terrace with beautiful sea views. The property sleeps 2 to 6 guests in comfort. The living area is comfortable and the property offers a light and airy open plan living and dining area. The outside areas provide options to have sun and shade all day long. Master Bedroom: The main bedroom has a king size bed and is en suite. The en suite bathroom has a bath, shower, toilet and washbasin. Good lighting and mirrors. The bedroom doors open onto the upper terrace and the room has lovely sea views. Shutters provide blackout for sleeping and security. Bedroom 2: A twin bedded room with wardrobe and mirror. Bedroom 3: A twin bedded room with wardrobe and access to outside terrace. Bathroom: Modern bathroom with shower over the bath, wash-basin, toilet. Mirror and opening window. Lounge: The villa enjoys an open plan living/dining area. The lounge has two comfortable leather sofas, flat screen TV, DVD player, CD player/ Radio, DVDs, books, family and card games. There is wifi throughout. The lounge opens onto an extensive terrace with outdoors dining area and pool. Kitchen: The villa has a spacious and well equipped kitchen – ideal for those who want to prepare their own meals whilst away! Full oven, hob, dishwasher, large fridge freezer, microwave, kettle, toaster. There is plentiful crockery, cutlery, glassware and cooking utensils, and lots of cupboard space. Off the kitchen is a utility room with washing machine and drying area. The villa is surrounded by Lanzarote stone walls. There is parking for 1 car on the driveway, and plenty of further parking at the side of the villa. The villa is on a large corner plot with gardens and terraces. There is a safety deposit box for guests to use, and free wifi throughout. Doors to the upstairs terraces benefit from lockable shutters, providing extra security and blackout for sleeping. 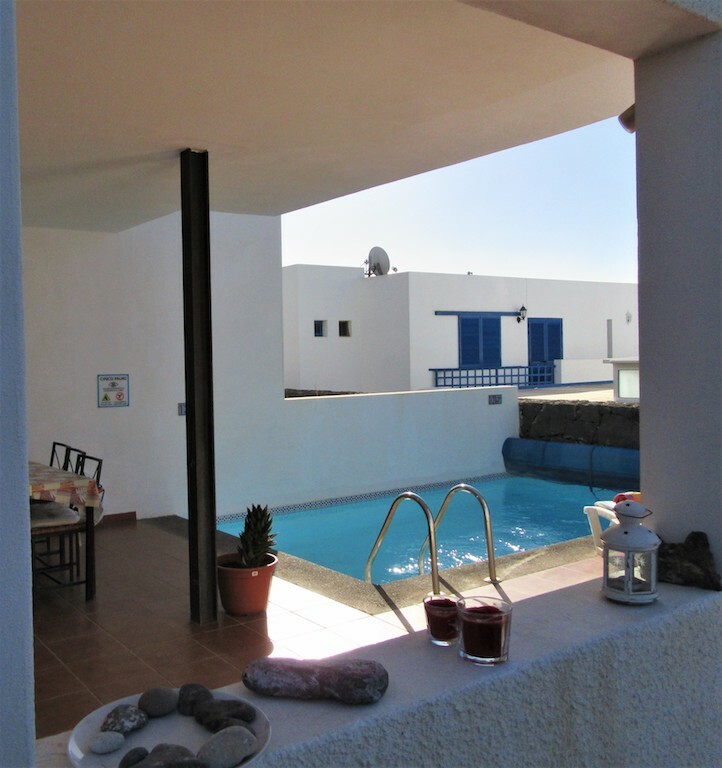 Our villa is a 10-15 minute walk from Marina Rubicon and 25-30 minute walk from Playa Blanca’s town centre. The walk is easy and fairly flat. There is a very well stocked supermarket just two minutes walk from the villa. 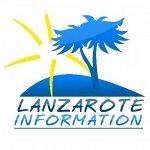 Playa Blanca is located at the southern tip of the beautiful island of Lanzarote. It has a relaxed ambiance and lots of wonderful restaurants, cafes and bars – many of them right on the waterfront promenade. The upmarket Marina Rubicon has sophisticated shops and restaurants and also hosts a weekly market on Wednesdays and Saturdays. There is also a harbour where you can catch the ferry to Fuerteventura (25 minute crossing time). Car hire isn’t essential. There is a bus stop close to the villa and buses run every 30 minutes to all parts of Playa Blanca, or a taxi costs approx 6 euro into the town centre. Lanzarote is a small island with a varied volcanic landscape. Driving is easy, and it’s great to see some of the unique sights the island has to offer. The above rates include up to 4 guests in the property. Our rates include final cleaning, and for stays of 10 or more nights, we include a complimentary change of bed linen and towels.